The perfect Spanish red wine for weekday drinking and a Ribera del Duero for the weekend. The appellation of Yecla has a reputation of producing of robust, high alcohol wines with an inky appearance and heady aromas. 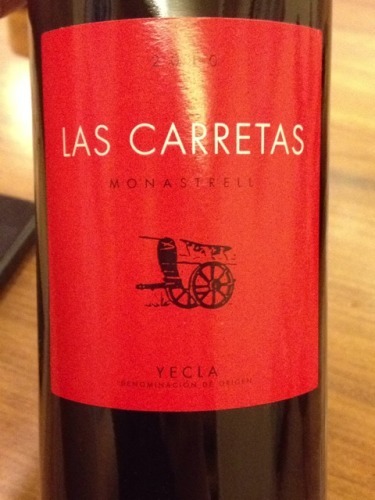 However, I might have found the exception of the rule with the 2012 Las Carretas Monastrell. Bodegas y Viñedos del Mediterráneo, also known as Altos del Cuadrado, is the proyect of the Castaño family in Jumilla and Yecla . In both winemaking regions, Monastrell is king. A name given to Mourvedre grapes grown in Spain, Monastrell is a big wine with complex and deep flavors. Primarily used in blending, Monastrell stands alone well as a delicious red. As a function of Spanish terroir, Monastrell tends to have a deeper plum and licorice note compared to other varieties of Mourvedre. On the nose very fresh aromas of black berry fruit with violets, licorice and cracked black peppercorn with juniper berries. On the mouth, full body, with an incredible freshness. Crispy fruit that reminds me of raspberry coulis, with hints of fennel seed this wine has an amazing silky texture with easygoing tannins. A very floral retronasal with a very polished finale. Quite possibly, the best value in the Spanish wine value at the moment in the private importation segment in Quebec. 93\100. Food Match: Anything from blood sausages, chorizo to Paella or other poultry based rice dishes containing rabbit or hare. Food Match: Perfect with any a Bavette marinated in homeade bbq sauce over a hot fire. Emina is represented by Valmonti in Quebec. This was a sample given by the agent for review in this blog. It seems to me that we have jumped to the winter season already in Montreal. Where did the fall go?. On the last few week or so, we have jumped to subzero temperatures With this type of weather, all i want to is to stay home, make some hearty dish and drink some robust wines all day long. If you are looking for body and character, Yecla and Alicante are the places to drink up in Spain. These Spanish wine regions produce wines with a mediterranean character full of character and spice. Monastrell is the principal red grape in both appellations giving wines with a heady bouquet and big body. Other international grapes such as Cabernet Sauvignon and Syrah are also permitted. When they are included in the wines, they take a mediterranean. I recently reviewed two wines given for press review of A.O.C & Cie, Châteaux et Domaines Inc. Both of them comes from the same family, Bodegas Castano. This a family domaine that lead estate bottling in the Area giving Yecla an international reputation for quality wines, away from the bulk image of the past. They also have been a pioneer in Spain working with Monastrell. The first wine Hecula is made by The Castano in their home appellation Yecla. They have been making wine since the 1950’s. Salinas is a more recent project of the family ( 2000) in the lower part of Alicante with a conglomerate of Swiss investors. The best part of these wines is that they are under $25 and will not hurt your pocket. Sierra Salinas. Puero Salinas 2010. SAQ Code: 11963751. Price: $24.30. Now for the food. I am a firm believer in wine & food regionality. So, I decided to go along with a dish made of chickpeas, serrano ham and chorizo sausage for the wines . The recipe is courtesy of food & wines from Spain. This is a quick dish that can be prepared on a weekly evening, or if you prefer for a weekend supper. Both wines are an excellent companion for this dish. The smokiness and animal notes of the ham and sausage in the dish complements well the aromatic notes of the Monastrell. Same thing of the pimenton which makes shine the spicy notes of both wines. The texture of the chickpeas act as vacuum for the tannins of the wines, giving a polished texture to them. With this last words, I will leave you until my next post! !